A few days ago I shared with you on instagram my heart snapshot art that I bought from Minted. A Valentines Day present for myself if you will. Well today, Minted is offering one just for a lucky My Sweet Savannah reader! That's 2 giveaways in one week! Click here to enter the other giveaway going on. Here is the mock up of mine, I haven't received it yet. I am on pins and needles waiting for it to arrive. picky, picky, picky. But, I think I got some really special ones in there. So, how would you like to be entered to win a 16x16 custom heart art piece, FRAMED?! Just go to Minted and let me know what you see that really stands out to you. use the promo code HEART10 to get 10% off! In order to ensure delivery by Valentine's day, you must purchase by Thursday this week. For an extra entry, pls. like Minted on Facebook, and for yet another entry, follow them on Pinterest. That's 3 chances to win! Good luck friends! I will announce the winner one week from today. I love Minted Christmas cards! I love the Within the Letters of you! I just LOVE it!! i love the field sketch at west elm! and i like them on fb already- huge fan of their prints! My comment published twice so I just deleted one. Sorry about that!! I've been drooling over the hear collage since I saw it last week! The Sanibel stationary is great as is the personalized gift wrap. Love the heart you created! I don't do Valentine's Day cards, but I love the Happy Love Day Valentine's Day Postcards. And I liked Minted on Facebook! Oh this is so cute!! I would love a heart photo collage. Or maybe a #1 for my daughters first birthday in May!! I love the heart collage or the Christmas cards, they are beautiful! With Love Valentine's Day Card! I love the XOXO Personalizable Bunting Banner. I like the Numbered Animals print on minted. It's adorable. I love the "It's too late to say Ho Ho Ho so we're sending XO XO XO". It's perfect for anyone who wasn't able to send out Christmas cards this year (the late Thanksgiving really threw me off). I love minted's invitations and Christmas cards! I am a facebook fan and liked them on pinterest. Thanks! I LOVE the peony art print and the vintage baby announcement. the bunting banners are adorable! i really like the "love builds a happy home" art print. They have lots and lots of cute things!! Lovely giveaway. Visited Minted and love the Conversation Heart Valentine Personalizable Photo Backdrops!I follow them on facebook and pinterest also. Thanks for the chance. Just started following them on pinterest. Love them! I love the heart photo collage, amazing giveaway!!! I don't know how I'd never seen that minted did artwork and not just photo cards! I love the Paper hearts and watercolor rainbow owl. Perfect for my daughter's room! I love the print of peonies in the jar! I follow Minted on Facebook! I follow minted in Pinterest! i love the personalized journals from minted. What a fabulous gift. I would love the heart too!!!!! What a great company! Minted makes such lovely items. I like them on Facebook as well as Pinterest. My favorite item was the feminine stationary. With a husband in the military, I write, A LOT. I LOVE the concept of making photos into something special for the home without just doing framed single pictures. THIS would look great in our new home on base. Thanks for the chance and for your generosity! 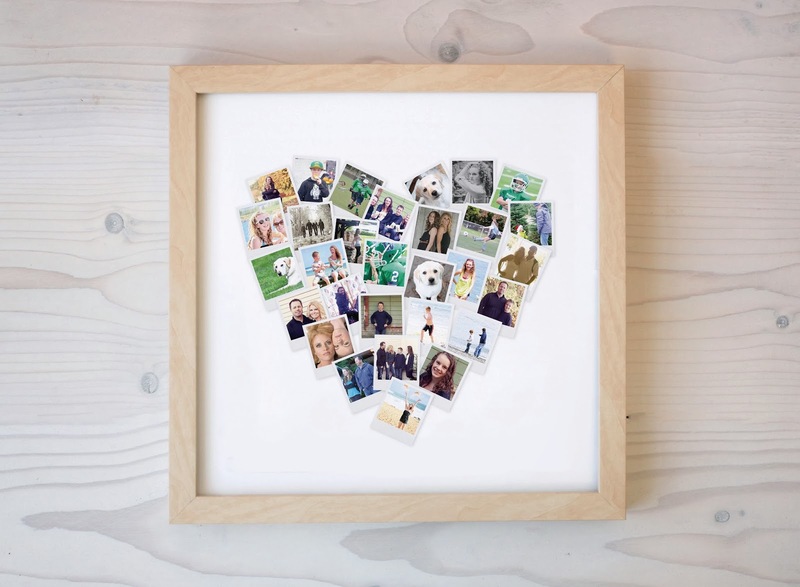 Oh my goodness...I just saw this print (heart) on Minted today and fell in love.....I would LOVE to win this. They have the most stylish cards! I love this heart art too! My Christmas cards were from Minted & I LOVED THEM! Thinking of doing V-Day cards next year. The Eiffel Tower in the Rain print is AH-MAZING! I was on the Minted website just today before I read your post. I really want one of those heart prints too! I like Minted on Facebook too! I'm also following Minted on pinterest! Room signs! My kids have more unusual names so love the room signs!!! I have enjoyed minted for many years! We love the Christmas cards! We used the chalk art design this year. The heart with sweet pictures is just adorable . I really love the Rules to Live By art print for the nursery. They also have some customized prints I've been envying. I'm following Minted on Facebook as Melody Camp! I'm following Minted on Pinterest as Melody Arredondo! I adore Minted's party decor.......it's fab! I love all things "hearts" so the heart snapshot is perfect <3 Liked on FB and Pinterest! Thanks so much! I love the Xmas cards. Next year! I liked 'em on Facebook.! Now following Minted on Pinterest. Oh my goodness, it's all so adorable. I love the family tree prints. Such a sweet idea. I liked Minted on Facebook. I'm following them on Pinterest now as well! I love the heart art as well as the stationery! I like the heart picture like yours! I would do older family pictures and give it to my parents. I already follow them on Pinterest & like them on Facebook. I love the Pickled Poppies and Little Clover prints but there's so many cute ones to choose from! I would order the art snapshot heart. Love it! The heart art w/ pics is hard to beat! Love it! Oh I'm a complete sucker for a simple design that has a little bit of interest…the Little Whimsy stationary is so very much me! I liked them on FB and Pinterest too! Christmas cards are pretty too! Love, love, love your heart print. I have been a fan of Minted for quite some time. Right now, one of my favorites from them is the sanibel island stripes personalized notecards...super cute. I "liked" Minted on facebook. I follow Minted on Pinterest. Love your heart of pictures. What a great giveaway! I think the photo art item, A Lifetime, is super sweet! I love the heart snapshot mix! I love MINTED. So many things to choose from. I am following them on Pinterest!! Thank you for the opportunity to win! How fun is the personalized wrapping paper?! My kids would LOVE that! I liked on FB and follow on Instagram. Thanks for the great giveaway!! I follow Minted on Pinterest! how to choose just one thing?!? i love several of the art prints for my walls, as well as the fun party decor for my child's birthday! Oh my I love the valentines!!! Ok I love everything!!! Following Minted on Pinterest! They have some great stuff! Liked Minted on Facebook, following Minted on Pinterest , LOVE LOVE the heart collage, Valentines, and wall art! So much to love! I liked Minted on FB! I like their baby girl shower invite- pink with crown... I actually may be ordering it for my niece's baby shower! Thanks for posting about Minted.. I hadn't heard about the company before! Will be following on Pinterest and FB as well! Following on Pinterest and on FB! I love any of the custom photography products. I love the heart snapshot art. So sweet and beautiful! I love the heart snapshot, but also the Love is You print - would be super cute with wedding pics! Artzee Designs (ArtzeeDesigns.com) is the ultimate canvas art destination for customers seeking art for their home. There's an opportunity to purchase pre-existing art OR Inspire Your Own art. If you Inspire Your Own art, Artzee Designs' graphic artists will custom design a piece of art exclusively made for that customer. Also, to note, all of our prices include printing the art on canvas as well. thatcanvas.com which you can try for your canvas prints.